Experts say Hurricane Ike caused massive damage to Texas' coastal ecosystem that could take a generation to heal. As scientists and land managers start to assess the storm's impacts on beaches, dunes and marshes, they are seeing signs of present damage and future worries to a coast already hammered by decades of pollution, population growth and habitat loss. "We're going to take the critters that crawl or walk, and for the full stretch of the coastal zone that got the full impact of the coastal flood, they're just eliminated." 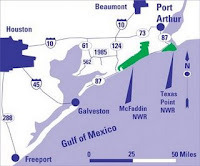 The United States Geological Service has posted some before Hurricane Ike and after photos of McFadden and Texas Point National Wildlife Refuges including this pic. " 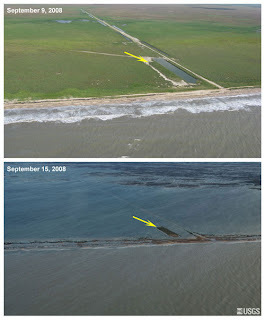 Oblique aerial photography near McFaddin Wildlife Refuge, TX on September 9, 2008 (top) and September 15, 2008, two days after landfall of Hurricane Ike (bottom). Yellow arrows mark features that appear in each image. Widespread inundation and persistent flooding are obvious here—and the extent of coastal change is difficult to assess." Hurricane Ike became a real monster and wrecked havoc on wildlife and wildlife habitat as well as people and domestic animals. "An official with the U.S. Fish and Wildlife Service said Tuesday the tidal surge from Hurricane Ike has left a "sheen" of oil on a southeast Texas wildlife refuge, potentially endangering rare species of birds and other animals. Tim Cooper, project leader for the McFaddin National Wildlife Refuge, said oil apparently leaking from ruptured drilling equipment has affected a large area of the 55,000-acre preserve. Cooper, who manages four refuge sites in the area, said a lesser amount oil has flowed into the nearby Anahuac National Wildlife Refuge. Both preserves are near the Bolivar Peninsula, which was practically wiped clean when Ike roared ashore with winds of 110 mph early Saturday morning.